Looking to setup an online shop? Simple eShop is a complete ecommerce package giving your business everything that is needed to sell your products online including web site hosting. We design the web site, we host the web site and we maintain the web site. All you have to do is add your products and you'll be selling online! 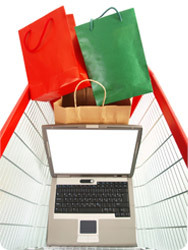 The Simple eShop ecommerce package has been designed from the ground up specifically for the small retail business. We have gone to great lengths to ensure our eCommerce web sites are as productive as possible but at a price even the smallest business can afford. We provide more than just an ecommerce web site, this is a complete service including all the support you'll ever need to make your online shop a success. Unlike our competition, who will charge you for any design changes you want in the future, the Simple eShop team will make as many design changes and alterations to your webshop as you want at anytime even if that means re-designing your entire store at no extra cost. No longer will you be stuck with the design you once thought was right for your business now that you can change your store as your business evolves. We are ready and waiting to setup your online business! "Having never run a web site before and being slightly wary of how and what to do I am amazed at how easy it has been"
"I would recommend SimpleEshop to anyone considering an e-commerce web site"
"I can't believe how easy it has been to setup an online shop! I wish I had done it years ago." "Having a SimpleEshop has increased my sales by over 15% and it is so easy to use"
"It is so easy to add and remove products the site controller is a doddle to use, all that is needed is clear and easy to navigate." "The guys at SimpleEshop are quick to reply to our e-mails and phone calls and can answer any query"
"Just to say thanks for your prompt, professional and courteous help developing our new website which has proved to be a comprehensive and complete package"
Can I use my own domain name? Yes you can. Do I need to pay extra to take card payments? No everything you need is included in the price. Do I need to install any software? No software needs to be installed. Is hosting included in the price? Yes hosting is included.